Depression is a common mental health condition, and its diagnosis is based on certain accepted criteria. It is twice as common in women as it is in men, and women tend to experience the symptoms more frequently and for longer periods of time. Depression affects not only the mind, but also the whole body, so the signs and symptoms of depression are divided into two categories: psychological and physiological. 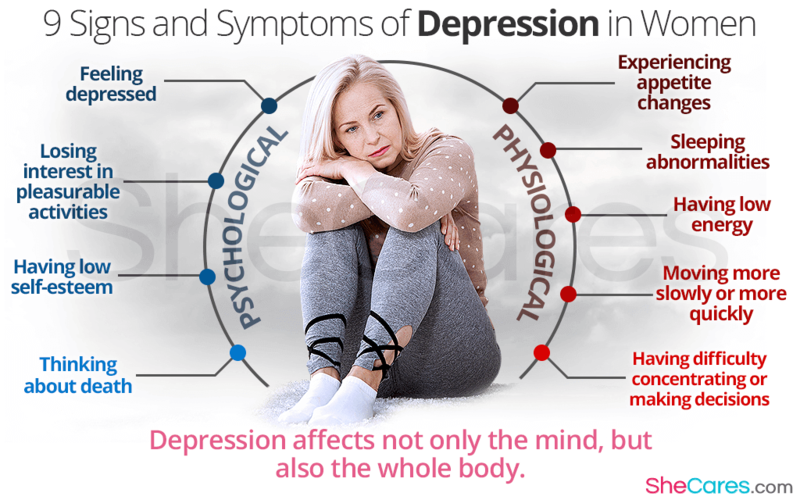 Sadness, heaviness, unhappiness, irritability, and feelings of emptiness throughout the day are the most commonly reported symptoms among women suffering from depression. Women often stop enjoying the activities that they previously appreciated, and often start avoiding people and isolate themselves from friends and family. Many women feel unable, unworthy, and lose their confidence. Feeling guilty is very common in depression, too. When the depressive feelings are too overwhelming, suicidal thoughts may appear and become so persistent that many women feel helpless and act upon them. Some women's depression affects their appetite, and they lose interest and pleasure in eating and significantly lose weight without having such intention. They might also start over-eating in efforts to comfort their sadness. It is estimated that 75% of women with depression suffer from insomnia, a difficulty falling or staying asleep, causing further distress and impairment of their lives. Other women tend to sleep much more than previously. Those suffering from depression often experience severe fatigue, constant tiredness, and general weakness, which inhibit their ability to function as they normally would. Depression very commonly affects the psychomotor skills, responsible for coordinating brain's activities with body's movement. This can result either in a slowed movement, including speech, or an agitated, purposeless movement, such as shaking limbs. Working, studying, and running errands might become a challenge for many women, especially when the mind is overloaded with chaotic and distracting thoughts. Depression means something different to everyone suffering from it. Two women do not experience their symptoms exactly the same. Generally, to be classified as depression, the symptoms have to be present for at least two consecutive weeks, including at least one of the first two signs, called cardinal symptoms. Fortunately, modern medicine and psychotherapy offer effective treatment options and help women overcome their depression once and for all.